RF Antenna - V pole - Should one leg go to ground and the other to signal? I'm attempting to follow this white paper in order to build an antenna. This is my first antenna and as such I have a rather simple question. Whether or not the terminal block is conductive through the center horizontal plane. IE is the top and bottom legs of the antenna separated and thus one goes to signal and one to ground or are they connected in which case they both are connected to both (which I admit makes no sense)? One leg of the antenna goes to the center conductor and the other leg of the antenna goes to the braided shield of the coaxial cable. The terminal block is just a way to make the connections, and it has two electrically separate positions. You can use any means of making the connection you have handy, as long as it is small compared to the wavelength. However, it's worth noting that this is a poor design. Specifically, it has no balun — a device for converting between a balanced device (the antenna, which as you can see is symmetric) and an unbalanced one (the coaxial cable, which has an inside and outside conductor that are very different). This means that the shield of the coaxial cable will act as part of the antenna, and the performance will vary depending on how the cable is routed. It may pick up common-mode noise traveling from your receiving equipment along the cable, which can be a consideration when trying to receive weak signals from sources such as satellites. You can read more about what a balun is and how it works in this application in the question Using a balun with a resonant dipole. It doesn't matter which wire is connected to which side of the V-dipole, as they both carry the same signal information (just 180 degrees out of phase with each other). Not the answer you're looking for? 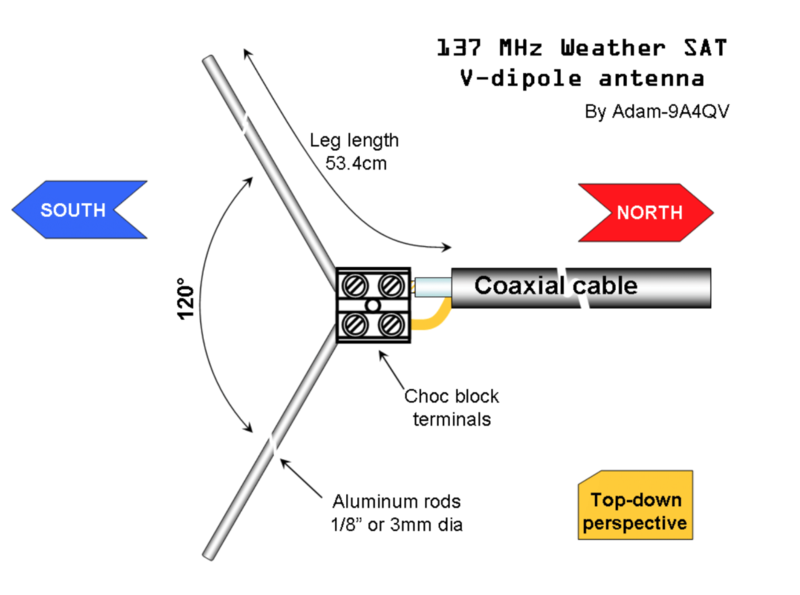 Browse other questions tagged antenna antenna-construction or ask your own question. How does a mag mount antenna achieve a ground plane? Is it possible to determine if I'm adjusting gamma match in correct direction with an SWR meter and if yes, how? Shortwave Antenna Listening with Portable Receiver Like TECSUN PL-660? Capacitive hats on wire dipoles? Is it possible to make antenna for one specific frequency? Can I use a helical ground plane radial in the same way that a loading coil works?